Gopher Gold is a video slot game that is about a gold mining gopher who cares about nothing in his life but finding as much gold as he can. This is good news for players as this game allows them to get to accompany that gold-loving gopher in his gold mining adventures so they can claim their own share of his gold. Players can do that by simply placing bets at the control panel of the game and then clicking on spin so the symbols can start spinning and forming rewarding line payouts. 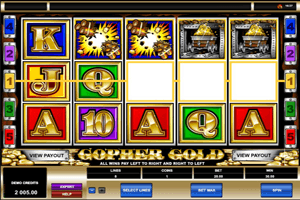 Play Gopher Gold Slot here. Apart from the line payouts, players can also earn a lot of credits through the bonus and special symbols that the slot game has to offer. The first one of these special symbols is the Gopher, he represents the wild symbol that will be able to fill in for any of the other symbols in order to aid online players in creating a payable combo of symbols so they can earn a payout. There is also the logo of the game, which is the scatter symbol that can pay players up to 12,000 coins. Players can check out the different payouts that they can earn by forming winning combos at the paytable of the game. They can do that by clicking on the View Payouts button that is found under the reels.